Ballock R.T, Song K.M. 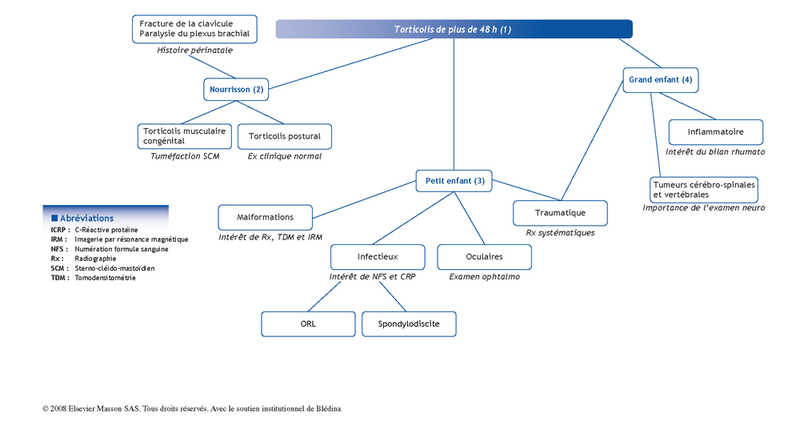 The prevalence of non muscular causes of torticollis in children. J Pediatr Orthop 1996;16:500-4. Peyrou P, Mouliès D. Le torticolis de l’enfant : démarche diagnostique. Arch Pediatr 2007;14:1264-70. Peyrou P, Mouliès D. Torticolis musculaire congénital. EMC (Elsevier Masson SAS, Paris), Appareil locomoteur, 15-200-B-50, 2008. Van Vlimmeren LA, Helders PJM, Van Adrichem LNA, Engelbert RHH. Diagnostic strategies for evaluation of asymmetry of infancy-a review. Eur J Pediatr 2004;163:185-91.